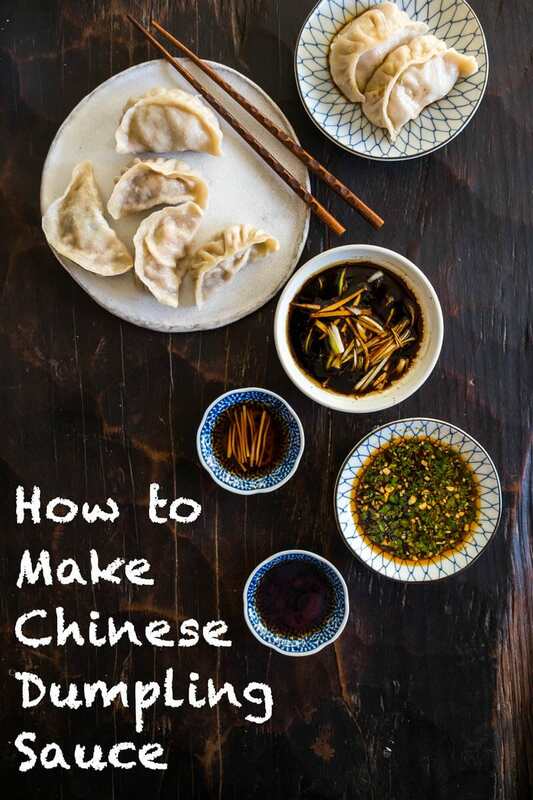 Four Chinese dumpling sauce recipes from northern to southern China. You won’t go wrong with any of them! Whenever I’m traveling in China, I am always amazed by the fact that people from different provinces have such different eating habits. Let’s take dumplings as an example. The dumplings that I’ve been eating growing up are northern style dumplings. They are usually bigger in size, have paper thin skin with a giant filling that contains meat and vegetables. Like I mentioned in my last post, we consider dumplings a staple and serve them as a main dish. We emphasize that the dumpling filling should be flavorful enough, so you can enjoy them even without any dipping sauce. There’s many northern style dumplings that call for a very simple sauce, sometimes only served with vinegar. On the other hand, southern style dumplings (especially Cantonese dumplings) focus on delicacy and variety. They are smaller in size, contain less filling, and are usually served as appetizers. The dumplings are usually served with a more flavorful sauce that might contain more than 10 ingredients. There is no right or wrong, and the options are endless. At the end of the day, it really depends on your personal preference. 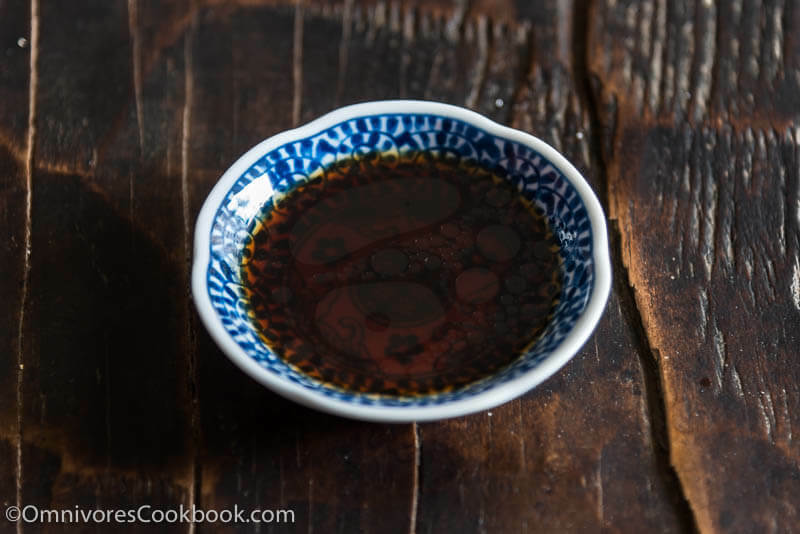 Let’s look at some of the dumpling sauce recipes below and see how different they are! This is the sauce my family uses for all the homemade dumplings. It’s super simple and brings out the great flavor of boiled and steamed dumplings. A rich and flavorful sauce that you usually find in Chinese dumpling restaurants. If you like bold flavor, this is the sauce for you! To make 4 servings, coarsely chop 1 clove garlic, 1 piece ginger, and 1 sprig cilantro. Mix them on the cutting board and finely chop and mix them, to let the flavors combine. 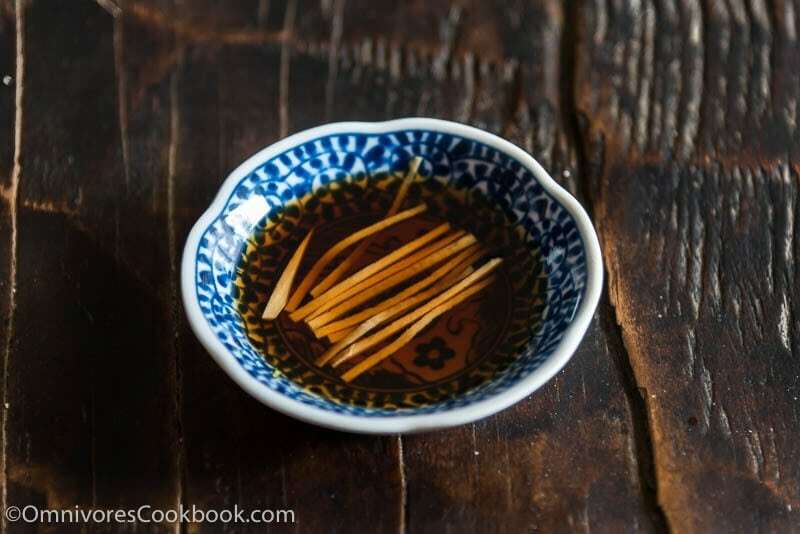 Transfer them to a bowl, add 2 tablespoons Chinkiang vinegar, 1 tablespoon soy sauce, 1 teaspoon sesame oil, and 1 to 2 teaspoon homemade chili oil or hot sauce to taste. You usually see this dumpling sauce when eating soup dumplings. But it goes well with many northern style dumplings too, especially ones made with red meat. It cuts the grease and makes a heavier dumpling taste more balanced. 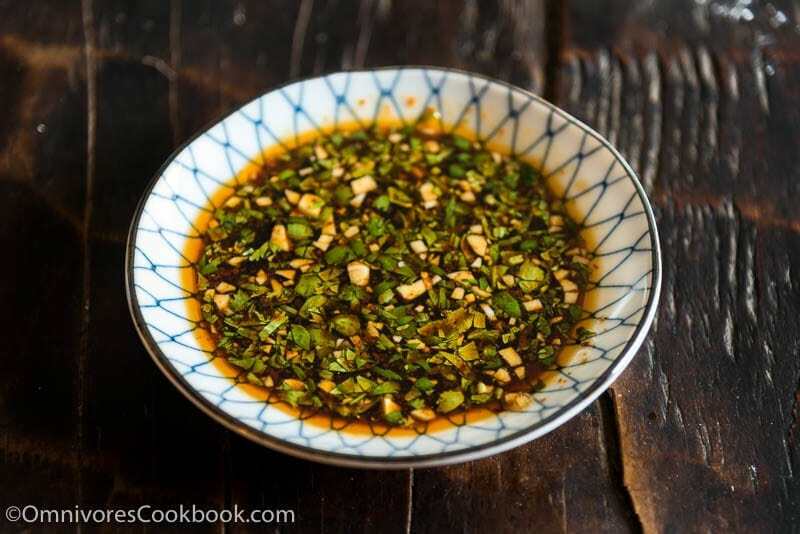 I learned about this sauce from Mastering the Art of Chinese Cooking by Eileen Yin-Fei Lo. Cantonese restaurant always serve spring rolls and other dim sum with this sauce. 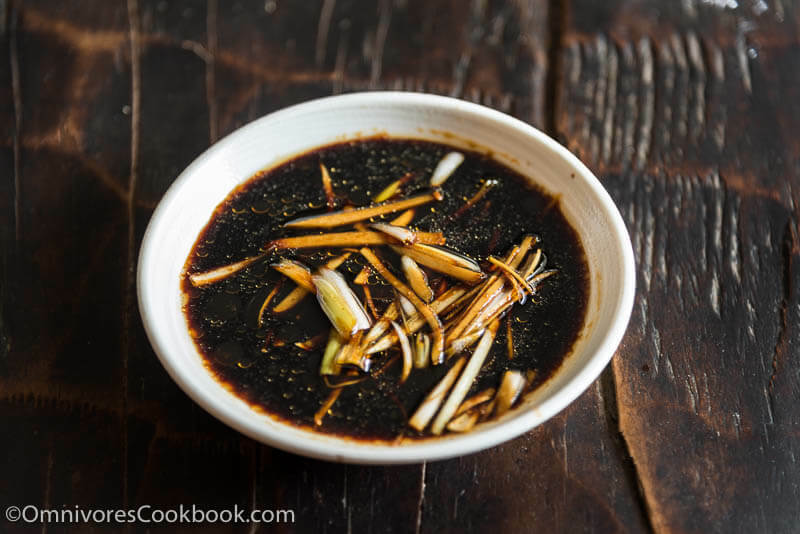 To make 4 servings of the sauce, combine 1 teaspoon sugar, 1 tablespoon dark soy sauce, 1 tablespoon light soy sauce, 3 tablespoons chicken stock, 1 and 1/2 teaspoons sesame oil, 1 and 1/2 tablespoons finely shredded ginger, 1 and 1/2 tablespoon shredded green onion (white part), and a pinch of white pepper. Marinate for 30 minutes before serving. I came across this dumpling sauce in the cookbook All Under Heaven by Carolyn Phillips. She calls it Tibetan salsa (Tsal). Some chefs call it sepen. The sauce is made with tomatoes, red chili pepper, garlic, green onions (or onions), salt, oil, and cilantro. Sounds a bit like Mexican salsa doesn’t it? The sauce is designed for Tibetan momo, which is quite similar to the northern dumplings I’m familiar with. So interesting! I had no idea there were so many dumpling sauces. I think my favorite might be the spicy one but I might have to try each one to be sure! I could eat every single thing you make Maggie! Love the dumplings and the sauce and I think bigger and full-flavored sounds great. Have a lovely weekend! Wow, thanks so much, Maggie. I love eating dumpling but do not know how to make dumpling sauce. This post help me a lot. Thanks for sharing and have a nice weekend. It’s looks like very beautiful and tasty. It like the cake and natural and your liquet is spacial. Thank you for your exceptional recipe. I have been a subscriber for some time , and I like to print your recipes that I like , or wish to try out . Unfortunately , as there is no ” PRINT ” command on your page of dumpling sauce recipes , this makes things a little inconvenient . but , other than that , I like your recipes , and hints , most helpful . Please keep up the good ( excellent ) work . Loved your compendium of dipping sauces! Thank you. HI Maggie! I love your blog and have been an ardent reader and supporter for a long time. Although your comment in the article about Tibet being part of China is hurtful, disrespectful and subversive towards us the Tibetan community who lived in exile in India while our parents generation were ruthlessly massacred by China and our ancient motherland forcefully taken from us. Could you please make that edit in your article where you mention ‘..food culture can be so different in one country, yet…’. I’d also implore you to read up on Tibetan history. Much thanks! Hi Lars, thanks for your honest comment and apologize for being culture-insensitive. I grew up in Beijing, where it’s written on textbook that Tibet and Taiwan are a part of China. My family is still living in China so I try to stay away from the topic in public. I’ve made the edit according to your suggestion. Last night I made vegetarian pot stickers (I made some minor tweaks to a recipe by Ming Tsai I found online) and I served them with your Northern Dumpling Sauce. Your sauce tasted great — next time I might use a tiny bit less black vinegar but the sauce was still authentic and yummy and I will definitely make it a gain! My husband dipped his pot stickers in oyster sauce — he really likes that sauce and said it tasted different (in a good way) cold. It took me FOREVER (I’m embarrassed to say how many hours) to prep and make the pot stickers but it was fun and worth it. I froze the leftovers and it makes me happy to know that on a night when I don’t feel like cooking I have a meal ready to go.